racing and life in general, all written by me or a member of my family. NEW ADDITION: You can now LISTEN to some of the talented members of my Family. RANDY MCLELLAN is my oldest brother's baby boy and he has a new CD out that is available on his website by clicking HERE. Wally and Maggie Go to the Races is a different way to teach new fans about attending live racing at Sam Houston Race Park. All names of the "characters" are actual names of towns or other geographic locations (counties, etc.) in the area north of Houston. 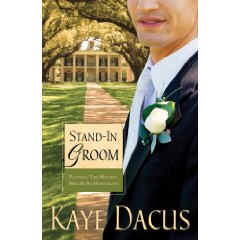 STAND IN GROOM is now available in bookstores around the country and on Amazon dot com. Kaye also has two more novels coming out this summer and a fourth scheduled for January 2010. Katherine Nell Dacus is the youngest daughter of my oldest sister Judy.